Fascinating group of ‘Retro’ or historic boat test reports written by our current editor, Peter Webster, back in the 1970s-1980s when he was Editor of Australian Boating magazine, and continuing through the early part of the "Fisherman & Boatowner" magazine era in the early 1990s-2005. 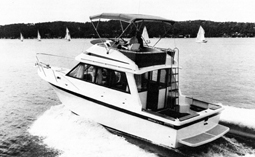 These reports, one of which is now published each month in Australian Boating, have renewed application in modern times, as all of these craft are still extremely popular on the used boat market, and readers are enjoying the chance to check their original performance and building standards. A key principle of the re-publication of these Retro tests is that not a single word, fact or figure is changed from the original test, which is carefully date-stamped for time relevance. Also proving of great interest is PW’s interesting ‘Hindsight’ assessment which is added to the end of each Retro test, bringing the relevance of the test right into today’s world.